Chem-Tainer 65 Gallon Double Wall Tank, part# TC2837DC is a Natural White industrial grade chemical containment tank. It's primarily used for chemical storage in commercial and industrial applications. This double wall tank acts as a tank within a tank. The outer natural white tank provides 110 to 120% containment for the internal tank. These are a few of the liquids and chemicals this tank is commonly used for: biodiesel, brine, calcium chloride, diesel exhaust fluid, fertilizer, polymer, sodium hydroxide, urea, and waste water. 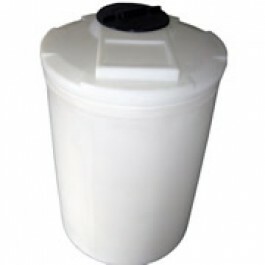 This plastic double walled tank is constructed with rotationally molded polyethylene resin and meets 40CFR-264.193 specifications for poly upright storage tanks. It's seamless design makes it durable, and resistant to cracks and dents. Double wall construction keeps precipitation and debris from entering the primary tank. This double wall tank complies with FDA standards 21 CFR 177.1520 (1) 3.1 and 3.2 for the storage of potable water. The Chem-Tainer 65 gallon double containment tank features a 8 inch threaded vented lid. Inlets, outlets, and other add-ons are typically customized to your needs. Chem-Tainer designed their dual wall tanks to be highly customizable. These double wall tanks come in sizes ranging from 35 to 1,000 gallons. Let's solve your chemical storage needs with the 65 gallon double walled captor tank from Chem-Tainer. National Tank Outlet is dedicated to delivering the ultimate solution in chemical compatibility and performance. Contact our sales team and double wall tank experts with your questions or customization requirements.